for four at the Fairmont Chateau Whistler Golf Club. MONTREAL, QUEBEC - AUR, a Fletcher Leisure Group product, is celebrating the launch of their AUR Golf Facebook page this year by partnering up with The Fairmont Chateau Whistler for the AUR Golf In Style Giveaway during the month of May. There will be one grand prize winner who will win "His and Her" AUR Golf Outfits and a round of golf for four at the Fairmont Chateau Whistler Golf Club. 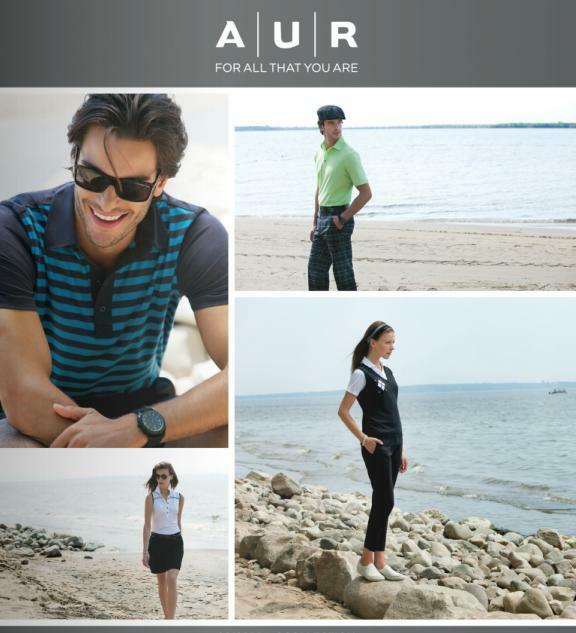 In order to enter, contestants must first become a fan of the AUR Golf Facebook page, and then select the "AUR Golf In Style" Giveaway tab to submit an entry. The contest closes at 11:59pm PST on May 31, 2012. "The Fairmont Chateau Whistler has worked closely with the Fletcher Leisure group for a number of years and we feel that partnering with AUR golf for this contest will leverage both of our social networks and offer our fans a great prize promotion giveaway," says Jennifer Tice, Public Relations Manager for the Fairmont Chateau Whistler. "We wanted to do something fun to announce that we are now on social media. This contest is a great way to educate people on who we are and what our brand stands for. Not only are we encouraging people to enter the contest and learn about us, but we are also inspiring them to go golfing!" says Christine Fletcher, Business Development Manager of Fletcher Leisure Group. Stylish Golfer would love these. Love the women's outfits.